I never knew that there was a holiday dedicated to any thing food related until I started Cake Duchess. Every day on Twitter or Facebook I will catch the national holiday of something to do with something delicious. But today’s food related holiday is one that is near and dear to my heart: National Bundt Day! YES, people. There is a holiday dedicated all for BUNDTS? The humble bundt cake does most certainly deserve its own holiday. 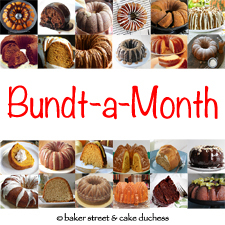 Anuradha and I created Bundt a Month a few months back with the idea to have one day a month that is all about bundt. We found some likeminded bakers that are very talented and share this mutual love for bundts. We decided with our talented baking friends to post today. Yes, I know! You may be grumbling that you just saw a bundt here a couple of weeks ago. I think you may forgive me once you are hypnotized by this bundt’s rich caramel glaze.The sticky caramel drips and oozes off the bundts’ curvy sides beckoning you to take a bite. It’s too late to run and hide; you’re mesmerized by its spell. A new series from Baker Street and Lora from Cake Duchess who share the same love for Bundts. Anuradha and I are, simply put, crazy for Bundt cakes. This is a love affair that is going to go the distance. We decided to collaborate and host an event where we’ll bake a Bundt cake with a different theme every month: Bundt a Month! Anuradha and I will pick an ingredient and announce it the first week of every month. All you Bundt loving bakers need to do is use your imagination on how you’d like to incorporate it and bake a Bundt – mini Bundt or large Bundt – and link it up to our blogs throughout the month. It’s that simple! Want to see what #BundtaMonth bakers has been busy baking these last few months? Dive into our delicious bundt recipes! Hop over to our Pinterest board for over 300+ bundt recipes and check out our new BundtaMonth page on Facebook too. You may have noticed I’m trying to keep things lighter around here. I may be sharing more vegan recipes than normal in these coming weeks. People, the holidays are coming up! Even though I share most of what I bake with family and friends, I do like to take a sample of the sweets sometimes. There were so many different bundts I wanted to share here. There was my standard vanilla bundt that is a keeper recipe. Instead I used this recipe from Versatile Vegetarian. 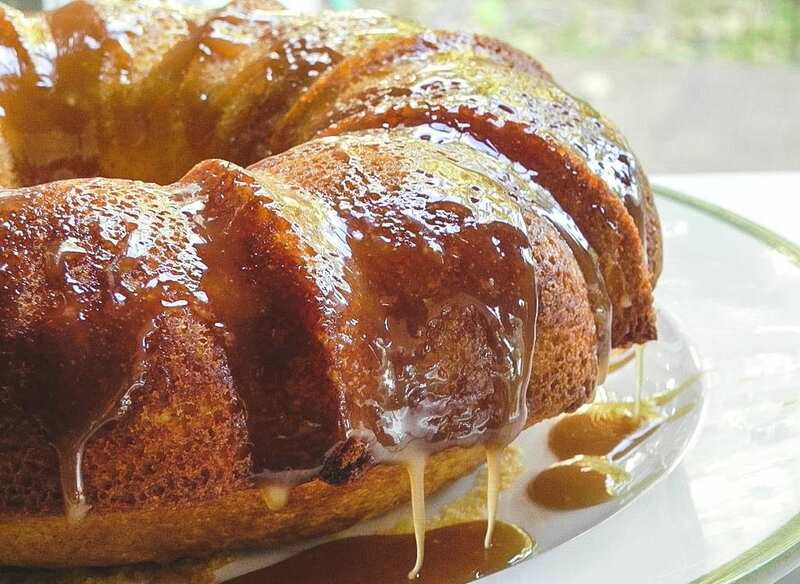 This bundt cake is very moist from the coconut milk and apple sauce. It’s the perfect vegan bundt cake recipe to be doctored up the way you like it. I chose a luscious caramel glaze because, well…I just LOVE caramel. So there you have it. If you aren’t into caramel glazes (who isn’t into carmel?!? ), you can do a nice dusting of powdered sugar. Preheat oven to 350 F. Coat a bundt pan with non-stick baking spray (or you can butter and flour the pan-I prefer baking spray). In a medium sized bowl, whisk together flour, baking powder, baking soda, salt; set aside. In another bowl, whisk together oil, apple sauce, sugar, lemon juice and the vanilla extract. Add flour mixture and coconut milk alternately starting and ending with flour mixture. Using a spatula, scrape the sides of the bowl and incorporate all the batter. Pour batter into the prepared pan. Bake for 1/2 on hour at 350 F then lower the heat to 325 F and bake for about another 15-20 minutes, or until a skewer inserted in the center comes out clean. Allow cake to cool for 10 minutes in the pan, then turn cake out onto a wire rack to cool completely. Cool slightly before removing to a rack to cool completely. When cake is just about ready, make the glaze. Love, love, love that you are using these ingredients! This looks amazing! This looks like one mean bundt! Where's my fork?!?!?! I could eat a piece of than right now. There can never be too many bundt cakes in one blog Lora, especially if it involves caramel! This is a goooood looking cake! i love the bundt-a-month idea, and i have a bundt in the oven right now! i'll be linking up… thanks! Coconut milk, applesauce…I definitely will love this bundt cake. The glaze looks super too. I am sorry I didn't get a bundt baked in time for Bundt Day but what a treat to see yours and the others too. Gorgeous! And I think that caramel glaze is especially nice, can I have a bowl of it please?? It's a good thing you lightened up that bundt because I'll be downing half of it on my own. That caramel dripping down the sides is just calling my name. This may be my favorite Bundt cake you've ever posted! That caramel glaze looks incredible! Happy National Bundt Day! Love this bundt cake Lorra, Yumy, glaze looks pefect. I'm drooling over that caramel glaze! Please save me a slice :). What a wonderful looking cake! I love the glaze, makes the cake even more moist and delicious! Lora, LOVE this! Your bundt looks so moist and delicious!!! Perfect for National bundt day! Can you taste the coconut milk? I am totally intrigued! And the caramel sauce-whoa. This cake looks beautiful and I am going to have to try it. I have the same Bundt pan. Oh mah gosh, this cake is beyond gorgeous! Beautiful job, Lora, as always. I'm sorry I couldn't participate for this one… I am so pressed for time!! Is there an ingredient missing? I see oil in the mixing instructions but not in the ingredient list. Love that caramel glaze – so gooey and delicious! Your glaze is amazing!! I always forget about the traditional bundt cake. Glad to see that you are making one a month. Will have to check out the pinterest board. Happy Thanksgiving to you and your family! For the life of me I couldn't remember if I commented on this or not. But I knew I had to stare at it again. It's making my tummy rumble. Bundt cakes are one of my favourites and then you add caramel, it's irresistible! This bundt looks wonderful and I love that you lightened it up a bit!